Man, am I ever glad that Snowmageddon didn’t happen LAST week. That’s because on Valentine’s Day, fourth graders from Bryant Elementary School in Independence took Jefferson City by another kind of storm. 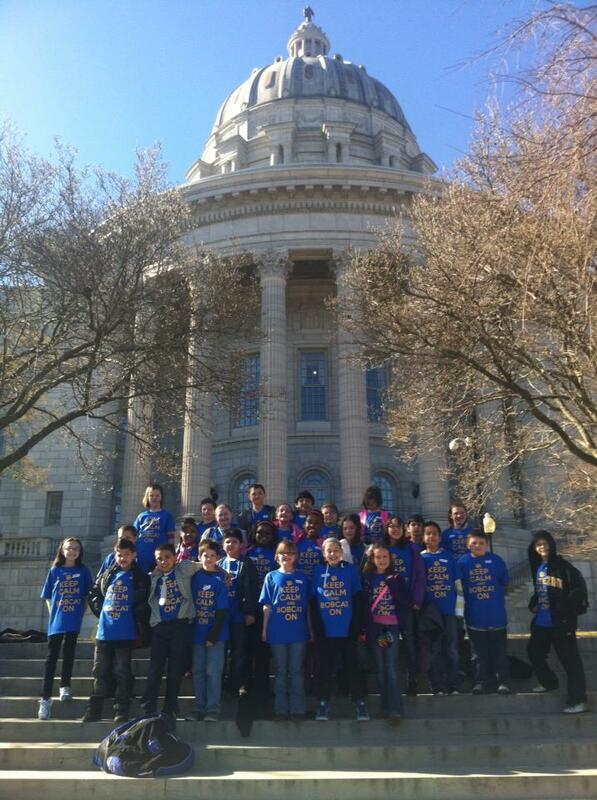 Here’s a shot of the kiddos just after arriving in Jefferson City. Thanks to all the generous folks who donated money, time and energy, fourth-grade parents raised enough funds to rent a charter bus (complete with a bathroom and DVD player!) 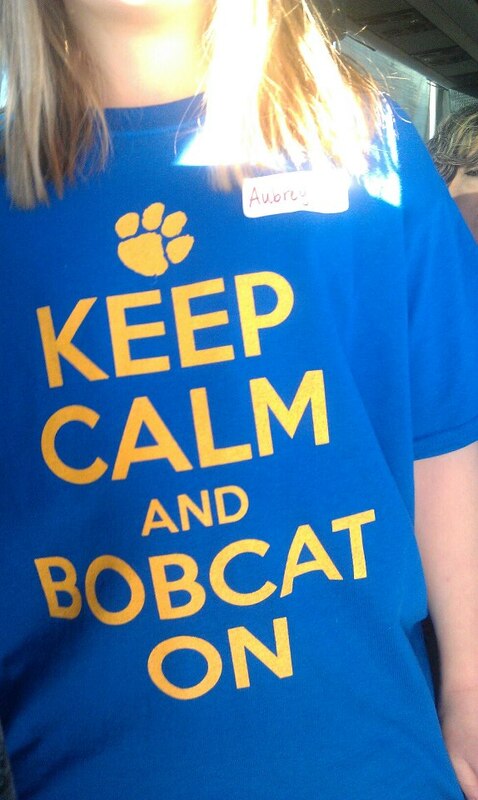 from Arrow Stage Lines, buy each fourth grader a screen-printed T-shirt to wear to the capitol, buy snacks for the trip, purchase each child a souvenir from the capitol and treat each of the 29 students who made the trip to a buffet dinner on the way home. In fact, let me just stop right here and say thanks to the Bryant parents who made the trip happen – Melissa, Stefania, Babette, Rod, Cody, Kristen, Erica, Frances – as well as Corporate Copy Print, Allen’s Banquet Hall, the Independence School District Foundation, Reps. Ira Anders and John Mayfield and the many other parents who allowed their kiddos to make the trip. I couldn’t be prouder of this community of parents and their supporters, who demonstrated true community organizing as they planned this trip. It was textbook, just like something I’d learn in one of my social work classes. In late December, parents met to decide how to solve their problem: They wanted their kids to visit the capitol, but the school said the trip wasn’t possible this year. Parents decided they wanted to see what they could do to make the trip a reality. A meeting in early January attracted more parents and sealed the deal – the trip would happen if parents could just come up with the more than $1,000 needed to rent the bus. Suddenly, every parent at the meeting mobilized. Fund-raising ideas flew around the room, mingling with suggestions of how to get the word out. Within a week, the rummage sale was on. Division of labor occurred organically, with parents taking on jobs that matched their strengths. It was a marvel to behold. And at the end of a very long day, the parents had enough money to give those kids the best trip ever. The T-shirts were particularly awesome. I’m not particularly prone to belief in the extraordinary, but this trip was meant to be. The weather was extra-perfect for February. Everyone – more than 50 people – was on time. We made it to Jeff without any hitches and made every tour with ease. The kiddos met three local state representatives – Rep. Noel Torpey met them at lunch – and their Supreme Court tour guide, John Constance, told them he’s a product of the Independence School District, sewing that all-important seed of possibility in the young minds. On the way home, we stopped in Columbia at a huge Chinese buffet restaurant that will never be the same. I’m pretty sure each one of the 29 kids used the bathroom on the bus at least twice. By the time we rolled up in front of Bryant, it was after 8 p.m. The kids and parents quickly dispersed to enjoy the rest of the President’s Day break, and my husband, 10-year-old and I headed for home. I asked our son if he’d had a good day.